It has been five years since my last visit to Chile and the developments in vineyard and cellar are considerable. Judging for the second Annual Wines of Chile Awards provided an ideal opportunity for an overview of the industry. 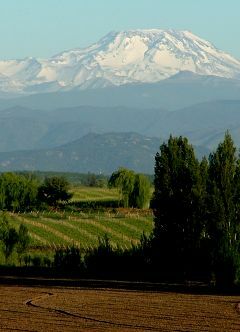 Someone has said that the best vineyards of Chile have yet to be planted. One surprise was that the trophy of the wine of the show was awarded to Viña Falernia, a winery in the Elqui Valley, that is to say Chile’s most northern wine region, and hitherto, an area with a reputation for producing grapes for pisco rather than wine. However, the effects of heat are tempered by sea breezes from the ocean and by the high altitude of the vineyards. Their lowest vineyards are at 350 metres, but rise to a breathtaking 2000 metres. The Casablanca Valley, which enjoys a climate that is considerably cooler than the central Maipo Valley, has grown considerably in importance. On our last night we stayed on the coast at San Domingo, with the beginning of the valley a short drive north east. In the morning the normally blue Pacific ocean looked more like the grey, sullen English channel and the sky was laden with cloud. Our first visit, to Casas del Bosque was a distinctly chilly experience, and vividly illustrated the benefits of a cool climate, demonstrating just why it was that their Sauvignon had won the Sauvignon trophy. Afterwards as we drove further east towards Santiago, the sunshine returned in abundance. The development of new areas is affected by the availability of water. Irrigation is usually essential; quite simply, without water there are no vineyards. 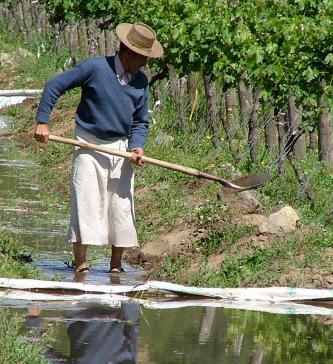 The owners of the two pioneering wineries of the Leyda region, namely Viña Leyda and Matetic have collaborated to bring water over from the Maipo river. The adjoining San Antonio Valley also benefits from the maritime influence, enabling Garcés Silva to make some finely-crafted Sauvignon. The evening there we could see clouds from the coast advancing across the skyline. On my very first visit to Chile back in 1989, you could number the wineries on the fingers, not quite of one hand, but certainly of both. But as the economic situation in Chile has become so much more stable – William Fèvre of Chablis described the country as the Switzerland of Latin America – more and more people have been encouraged to invest in the wine industry. Maybe they have made their money in some other activity, such as Eduardo Matte at Haras de Pirque runs a successful stud farm, or they have realised that their land is suitable for viticulture. At Perez Cruz, for example, they previously reared cattle. Certainly during the last ten years or so, there has been a veritable explosion of new wineries, including some foreign investment such as Michel Laroche in Chablis, Jacques and François Lurton from Bordeaux, to name but a couple. The 2004 map of the Chilean wine regions now lists 140 wineries. Five years ago Chileans were only just beginning to sort out the differences between Merlot and Carmenère. Today the not so subtle differences between the two varieties are fully appreciated. However, a Chilean Merlot without any Carmenère at all can become a touch soupy and jammy, while Carmenère itself is being paid much more attention. Often it is at its best in wines like Viña Echeverria’s 2004 Carmenère, the best value red wine of the show, with lovely ripe berry flavours tempered with the slight herbaceous lift that is characteristic of good Carmenère. Other producers take it more seriously, and age it in wood. This is fine but if overdone, can leave you with a mouthful of oak and vanilla, which completely overwhelm the original Chilean flavours. The confusion between Sauvignon and Sauvignonasse, or Sauvignon Vert, has also been sorted out, so that there are now any number of seriously good Sauvignons from Chile. The best achieve an attractive balance of fruit, body and acidity. They are not as juicy as those of new Zealand, but have more body and weight than a Sancerre. Casas del Bosque, novas, Garcés Silva, Montes, Matetic and Viña Leyda are amongst the best. Pinot noir is not an obvious choice from a relatively warm climate, but in cooler areas, there are some very successful examples, not yet of gold medal, for the purposes of the wine awards, but certainly very serious silver medals, from Viña Mar and Agustinos, while a 2004 barrel sample from Morandé also promised well. Syrah too is providing surprises, with not only the northernmost example from Viña Falernia, but some attractive peppery flavours from further south, such as Montes and Matetic. Then there are occasional examples of Malbec, which Chileans prefer to call Cot, so as not to confuse it with Argentinean Malbec, and for whites, Viognier, Gewürztraminer and Riesling all featured in the awards, as well as a delicious Late Harvest Muscat from Viña Francisco de Aguirre. Vineyards are shifting up the hillsides. now that drip rather than flood irrigation is possible, the positioning of vineyards on valley floors is no longer necessary. In Apalta Montes have some fabulously situated vineyards on steep hillsides, and outside the town of Santa Cruz, Luis Felipe Edwards is clearing land at an altitude of 1000 metres. At that height the evening breeze was distinctly fresh. Casa Silva, with vineyards in three different parts of the Colchagua Valley are working on the differentiating the terroir of their vineyards. Although the climate of Chile is very suitable for grape growing, there has been less interest in organic viticulture than might be expected. Alvaro Espinoza at VEO is putting this right, showing how he makes his compost and encourages the natural flora and fauna of the vineyards. There are alpaca, geese and chickens, which are regularly moved around the vineyards. Above all he seeks to enhance the biodiversity of his vineyards. Cellar techniques in Chile have improved, in common with the rest of the world, and in some instances outside winemaking influences were noticeable. For instance at Luis Felipe Edwards where they had a French winemaker and now have an Australian consultant, the more recent vintages were more heavily oaked, and the added acidity more obvious in the mouth, whereas their older wines seemed to have a European touch. Herman Lyon at Perez Cruz trained at Montpellier and then worked in France, and again his Bordeaux blends had an appealing subtlety. Care certainly needs to be taken with oak, but that is something to which a good winemaker is sensitive. Nor can oak-ageing techniques be learnt overnight. It was not so long ago that Chile was still using the traditional raule vats. We saw many well-equipped cellars, and in several instances, beautiful architect-designed cellars, exuding style and elegance, as well as practicality. Montes opened their new cellar in December; feng shui plays a large part in the design here with flowing water. At Perez Cruz the cellar is built in Chilean pine, with elegant lines inspired by the form of a barrel and at Haras de Pirque the cellar is in the shape of horse shoe. In short you could not avoid noticing the intense feeling of excitement that pervades the wine industry of Chile, with the promise of even greater things to come.